Vermin, rats, bugs, flies and other nasties can serve as vectors that can cause viruses and bacteria to flourish at your hospital and sicken not only patients but also caregivers and staff. Even the most “ship shape” hospitals can easily become breeding grounds for pests. The sooner you catch and deal with the vermin, the easier it will be to avoid complicated and tragic eventualities, like outbreaks of sickness, lawsuits, and massive clean up costs. Rats and other pest can take up residence in hospital food and can thrive when sanitation processes come unhinged. But “bad hospital hygiene” is not the only cause of pest swarms. Often, vermin hitchhike their way into hospitals via patient belongings or burst pipes. To further complicate matters, the untrained eye is very bad at “sussing out” the root causes of pests. For instance, an untrained observer may see flies buzzing around an operating room and blame the problem on bad sanitation or janitorial practices. A deeper analysis, however, may show that the swarm actually came from three floors up – caused by a hole in a window or break in a vent seal. Unless/until the root problem is found and dealt with, the swarms of pest will continue. 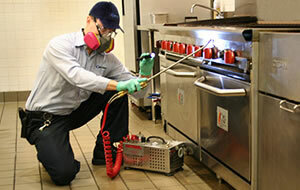 The Bay Area exterminators at Matrix PE believe that pest control is a process not a project. In other words, you don’t simply want to deal with the “outbreak de jure” – a swarm of flies, a rat infestation, etc. You want to eliminate the problem and prevent similar problems in the future from threatening the well-being of your patients and the business of the hospital. Get in touch with us today to find out more about how to control your hospital pest problems permanently.